We were gone Monday and Tuesday to visit with family but this morning we are back and packing lunches, snacks and a second breakfast! Also, this is the last day to enter my Lunchbox Love Giveaway! Don't miss it! 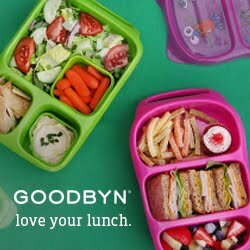 We are so excited that our yumboxes came and packed our first lunch in it today. I packed my first grader some of the new Chobani Champions tubes, apple bunnies, Naturebox cinnamon almonds, two mini chocolate chip cookies, two bear peanut butter and honey sandwiches, carrots and a few chocolate chips. He also has ice water and of course a Lunchbox Love card. Well, and now we know that we will never see a crocodile sticking it's tongue out at us, lol! Since we have to catch up on some things and run errands I also packed my 3 year old a yumbox with a second snack breakfast. She has cheese, apples, carrots, Naturebox cranberry almond bites and some nitrate free ham. My oldest also needed a snack today so we packed apple bunnies, a cereal bar and Naturebox cashew power clusters in our Lunchbot Trio. Hello! I haven't seen you around much. I've been busy! These are cute. I love your swirl bread!